This article is provided courtesy of Oregon State Parks. Knowing where and how to bring your favorite four-legged friend with you on adventures can sometimes be a little tricky. Not all parks allow pets (think national parks), and those that do may have little to no signage. So what’s a dog owner to do? Well, with a good amount of common sense and a lot of respect for mother nature and your fellow beachgoers, the experience can be fun for everyone. We’ve put together some do’s and don’ts for taking Fido to splash in the waves on the beautiful Oregon coast. 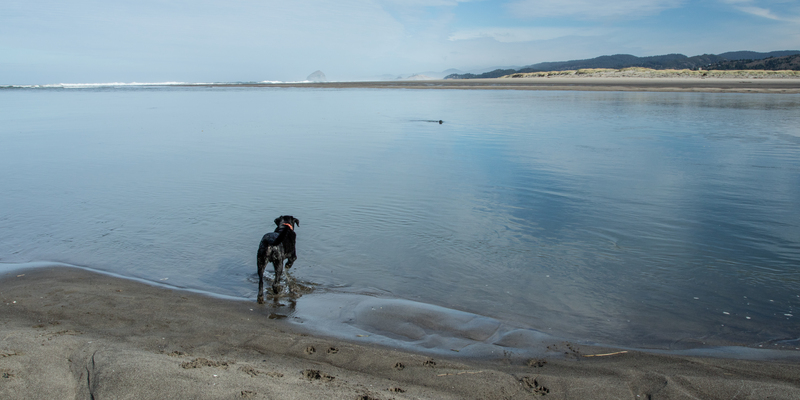 Pets are welcome on most ocean beaches in Oregon state parks, and they usually don’t have to be leashed, although they must be under direct control (within sight and responsive to commands). You should have a leash ready in case you’re asked to restrain your pet by a park employee. Follow posted leash regulations for the safety of your pet and for others. When one owner is following the rules and another dog is not, it can lead to unsafe interactions between unfamiliar animals. While you may know that your dog means no harm, the other person does not. There may also be places where pets are not permitted on some beaches or at certain times of the year in order to protect wildlife. Follow posted rules and check www.oregonstateparks.org for updates on restricted beach areas before you go. Respect for nesting wildlife is essential. Particular attention should be paid to closures and restrictions that protect western snowy plovers and other shorebirds. For migratory species, coastal habitat provides an essential resting spot on journeys that can stretch thousands of miles. If they are disturbed or harassed during these vulnerable periods, it may mean a fatal disruption to the rest of the migration. The threatened western snowy plover’s nesting season extends into mid-September, and the species needs a little space and isolation during that time to successfully thrive from generation to generation. An excited dog romping through the surf and dunes can pose a significant threat to this species, so dogs must always be kept away from these areas. You’re responsible for picking up after your pet. Always remember to bring a poop-scooper or plastic baggie to pick up any waste. Carry your bag with you so that you can ensure it makes it to the trashcan. Leaving bags for picking up “later” means that a large number get forgotten, creating a mess for other beachgoers. Besides stinky poop, it is also the dog owner’s responsibility to make sure their pet is calm during quiet hours (10 p.m. to 7 a.m.) when in campground settings. In general, you’re responsible for your pet’s behavior at all times, including any noises or aggression. Remember that you’re liable—not the park—if your pet injures someone, so don’t tie them up where they might react defensively to a child or other unsuspecting visitor while you’re away from your site. Your pet needs to be physically restrained any time you leave an off-leash area or beach, meaning you must be holding them, holding onto their collar, or have them on a leash no longer than six feet. Leashing your pet prevents them from tangling with wild animals or other people’s pets, getting lost, ransacking campground garbage, damaging plant life, or being hit by a car. It also avoids a citation! The exceptions (besides off-leash areas and beaches) are if your pet is inside your vehicle, tent, or pet-friendly yurt or cabin. In these cases, they must be under voice control and within sight. Up to two pets (cats and/or dogs only) are allowed in each pet-friendly yurt or cabin. Call Reservations Northwest (RNW) at 1-800-452-5687 8 a.m. to 5 p.m. Monday through Friday to make reservations as online reservations are not available for pet-friendly facilities. Unless otherwise specified, pets are not allowed inside park buildings. Of course, exceptions are made for service animals. In keeping with the Americans with Disabilities Act, a service animal is defined as a dog that is trained to do work or perform tasks for the benefit of an individual with a disability. (Providing emotional support or deterring crime are not considered qualifying tasks.) Except under special conditions, like beaches, service animals must also be restrained while in state parks.